This IBM Redbooks publication is the third volume of a series of redbooks called IMS in the Parallel Sysplex. 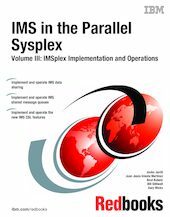 These redbooks describe how IMS exploits the Parallel Sysplex functions and how to plan for, implement, and operate IMS systems working together in a Parallel Sysplex. This book encompasses two parts. Part 1, Implementation, is a description of the tasks an IMS installation must execute to enable each of the functions. Part 2, Operations, addresses the operational issues associated with running an IMSplex that include startup and shutdown, steady state operations, online change, and recovery from failure. Both of the parts are divided into chapters addressing the sysplex services exploited by IMS to support block level data sharing, connecting to the IMSplex, shared queues, and the systems management functions enabled with the Common Service Layer introduced in IMS Version 8 - operations management and resource management. Additional topics are addressed in appendices or incorporated within these major topics.